Its mid week and am already longing for the weekend 🙁 How is it going for you guys? Today am going to review a hair oil from The Nature’s Co brand. I have already reviewed few of The Nature’s Co products. You can check them out here. For me, The Nature’s Co products are either a hit or miss. Some products are very good and some are very average for the price. Let’s see where The Nature’s Co Rosemary Sage Thyme Rejuvenating Hair Oil falls. A gentle, restorative, natural treatment for your hair. This exceptional blend of essential herbs stimulates circulation in the scalp and promotes hair growth. Scalp problems like dandruff and excessive secretion of oil will also be normalized. Apply sufficient quantity so as to cover the scalp completely. Massage gently for a few minutes. To prevent hair loss and improve overall hair health, use this oil thrice a week on alternate days. Oil base, Aroma & Natural Preservatives Q.S. 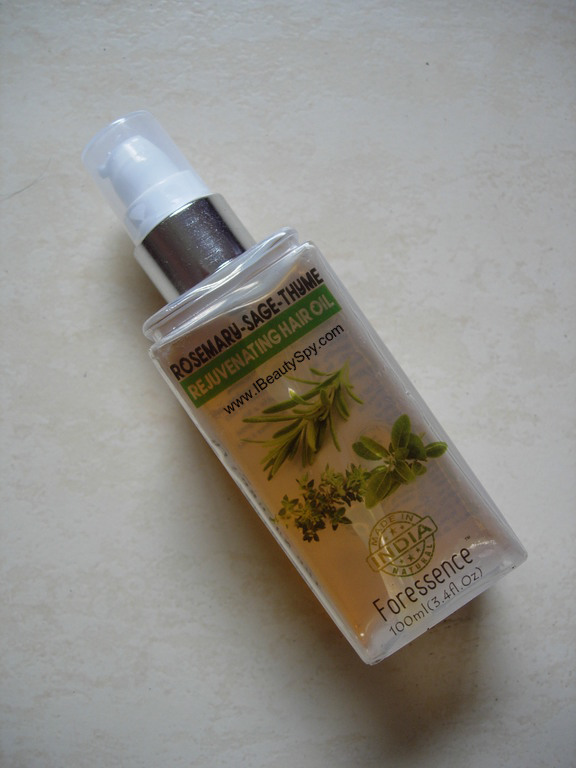 The Nature’s Co Rosemary Sage Thyme Rejuvenating Hair Oil comes in a pump bottle packaging which is very convenient. I have never seen hair oils in a pump bottle 🤔. I was mainly attracted to this hair oil on seeing the ingredients. Rosemary, sage and thyme are all very beneficial to prevent hair loss and thicken hair. The Nature’s Co Rosemary Sage Thyme Rejuvenating Hair Oil has a pale golden yellow color. The fragrance is that of the various essential oils added to it – very soothing and calming. But it is a little strong and those who don’t like the smell of essential oils might not like it. But I liked the smell. It instantly relaxes and calms my mind. The consistency of The Nature’s Co Rosemary Sage Thyme Rejuvenating Hair Oil is very light and non-sticky. Since its summers I like using light hair oils only. I massage a good amount of oil on my scalp and leave it overnight. Some heavy oils cause breakouts on my forehead if I leave overnight. But I haven’t faced any breakouts with this hair oil. The Nature’s Co Rosemary Sage Thyme Rejuvenating Hair Oil gets washed off easily. After washing, I could feel my hair is smooth and has a little shine. It doesn’t weigh down my hair and so my hair feels voluminous and bouncy. Coming to its claims of preventing hair fall and promoting hair growth, I have noticed less hairfall with continuous use. But can’t comment on hair growth. Maybe it needs to be used for a longer time and can’t be said with just one bottle. I don’t have any dandruff, so can’t comment on that. But it does help to reduce excess oil secretion in summers. Verdict time! I liked The Nature’s Co Rosemary Sage Thyme Rejuvenating Hair Oil. But nowadays there are a whole lot of natural herbal hair oils in the market with lesser price than this. So I don’t think I will repurchase. I feel that when The Nature’s Co was launched, it was one of the few brands offering natural, chemical free products. So the price seemed okay. But now with the launch of so many other natural, organic brands, the price of The Nature’s Co products seem expensive. Just my two cents! What do you guys think? * Light and non-sticky consistency which makes it perfect for summers. * Relaxing and rejuvenating scent of various essential oils. * Controls hair fall and makes hair healthy. * Normalizes excessive secretion of oil. * Makes hair shiny and voluminous. 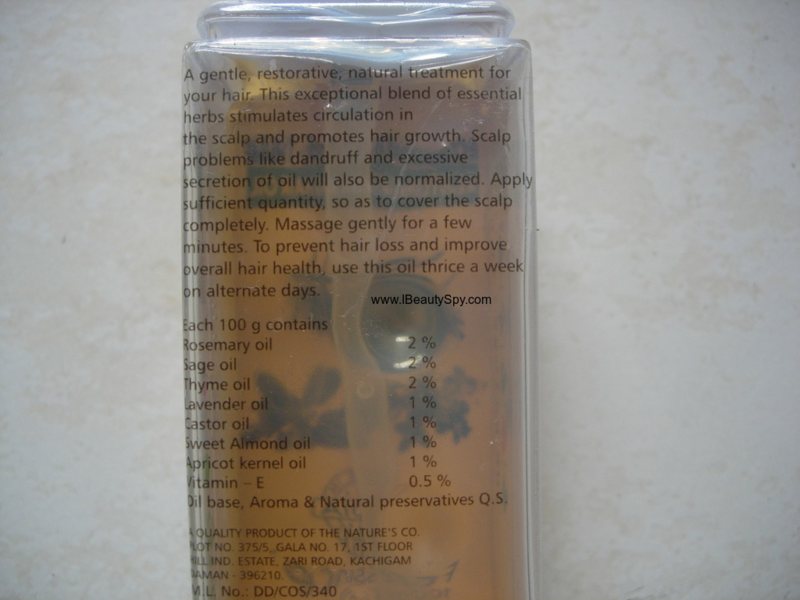 * Contains rosemary, sage and thyme oils which help in hair growth. * Complete ingredients not mentioned. Only oil base is mentioned. But we don’t know what is the oil base. Yes, if you have oily hair and need a light weight hair oil and don’t mind the price. No. But if its on a 50% discount, I might 😛. Overall, I like The Nature’s Co Rosemary Sage Thyme Rejuvenating Hair Oil. It contains good ingredients for hair and makes hair healthy. But I don’t think I will repurchase unless its on a 50% discount. There are many more affordable herbal hair oils nowadays. 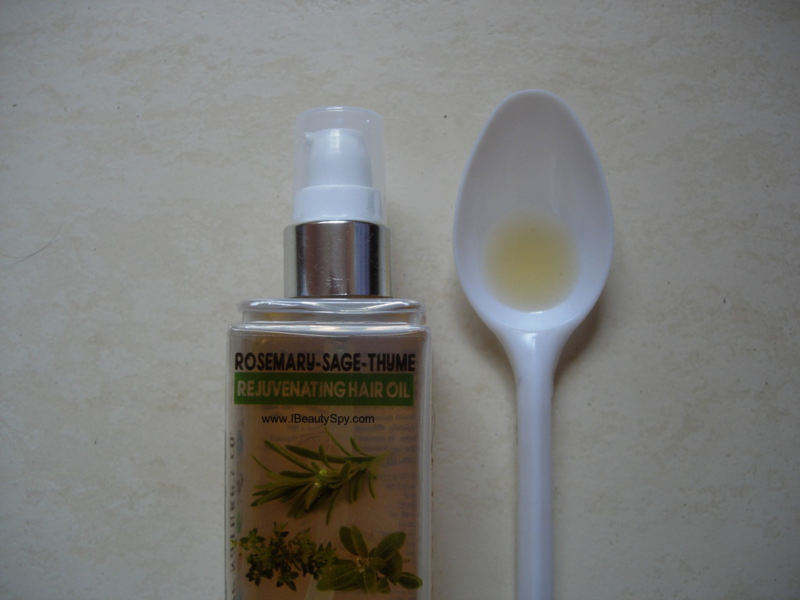 Have you used The Nature’s Co Rosemary Sage Thyme Rejuvenating Hair Oil? Do share your experience in the comments below.